While it makes its appearance in a few places in the document, I propose that a renewed commitment to Luther’s understanding of the universal priesthood is a vital and overlooked answer to these and many of the questions asked in this report. Bishop Eaton also states, “We speak about grace, about our work in advocacy, about the relief and development work we do, about our inclusiveness and diversity . . . about our ecumenical and interreligious dialogues and relationships. These are true and important, yet they are not exclusively Lutheran. . . . So what is distinctive about being a Lutheran church, and how do we agree on and unite around priorities that are important for the whole of the ELCA?” While the universal priesthood (aka priesthood of all believers, vocation, and ministry in daily life) is not exclusively Lutheran, it is a core component of the Reformation, it is likely the most underdeveloped aspect of our life together, and it holds the potential to renew and revitalize our church. As I read through the report I consistently encountered pleas and aspirations to renew and invigorate the corporate, gathered aspect of our life together. For example, “membership growth is key to the ELCA’s future” (p. 5) and “To grow, ELCA congregations have to think and act more creatively” (p. 7). “Discussions, without exception, gave very high importance to the ELCA’s service and advocacy to alleviate poverty and work for justice, peace and reconciliation in local communities and nationally and globally” (p. 13). I saw only passing references to the universal priesthood. “We are a church whose people engage in ministry in daily life—we empower people in God’s calling at work, at play, in families and households, and in communities” (p. 9) was the clearest reference, and there were a few others. Overall “the tide of declining membership” and concern about how to counter it appeared to be the most pervasive theme. As broad and thorough as the section (3.2) on trends affecting the church is, one critical trend was absent: the reality that institutions are no longer held in high regard or seen as being worthy of people’s time. This is especially true among younger people, and yet the focus of the report consistently hit on themes that revolve around the question: How do we make our institution more relevant, more responsive, attractive to younger people, and above all, capable of growing? My argument is this: the way forward isn’t a matter of getting the world into God’s church; it is about getting the church into God’s world. And the easiest, most relevant and productive means of doing that is by returning to Luther’s focus on the universal priesthood. The Spirit’s power is unleashed when we simply thank and support people for the ministries they are performing by raising children, caring for elderly parents, being an ethical student or worker, and striving for justice and peace in all the earth. I do not intend to pour cold water on being the “church for the sake of the world” through the many good things we do in and through the gathered church. The ELCA’s “hunger and malaria campaigns, responding to disasters and humanitarian crises, calling out racism and violence, and building bridges for peace and reconciliation with our ecumenical and interfaith partners” (p. 14) are important and vital work, and needs to continue. But when our focus remains principally on what we do in and through the gathered church, we overlook and (in fact) discourage the overwhelming amount of ministry that we do every day in our homes, at work and school, and in our communities. As the report says, “Members of this church live out their faith through service and engagement in their communities and with other parts of the church” (p. 9). In the section on Faith Formation and Discipleship the report asks, “A focus on faith formation and discipleship means always considering why we do what we do as a church.” The critical question here is this: What do we mean by church? In the research I have done recently I have discovered that by and large people answer that question by saying that church is what we do when we are together. When we’re not at church, well, the rest is just life. Ask any pastor and you’ll find that most people are consumed by life, they’re overly busy, and because of that pastors routinely wring their hands and say “We can’t ask them to do anything more for the church.” The further implication is that we should be “understanding” when they can’t come to church because of all their commitments. In addition, my research has led to the conclusion that ministry is defined as “something extra.” It’s teaching Sunday school, working in the food pantry, or serving on a committee if we have the time, the interest, or the money. “Young adults . . . juggle the demands of work, education or (for some) unemployment, they will look for and value flexibility in the ways they can connect to church and participate in worship and ministry” (p. 14). What is wrong with that last sentence? What’s wrong is that we, the leaders of “the church” don’t see, value, or equip young adults (or most of our members) for the ministry that they carry out in God’s behalf in their work, their education, among their family and friends, or in the community. “We have a precious gift in the eyes of younger people who are part of the ELCA, yet we struggle to attract young people. How can we be seen as more relevant and responsive to their hopes and needs?” (p. 16) How can we be seen as more relevant and responsive to the hopes and needs of all our members? By affirming, valuing, and equipping them for the multitude of ministries that they carry out every day of their lives. Among the proposed priorities on p. 17 is this: “We are a visible church deeply engaged in public witness and service for the sake of justice, peace and reconciliation in the U.S. and the world.” Amen. This is most certainly true. But most of the time this “deep engagement in public witness and service” only gets reported and supported when it happens in and through the gathered church. Too often we categorically overlook the “deep engagement in public witness and service” that the church as ekklesia (the called-out people) perform on a day-to-day basis. Refocusing our vision so that it includes both what we do as the gathered church and as the scattered church is a counter-intuitive move. At first blush, considering a deep and thorough emphasis on “equipping the saints for the work of ministry” (Eph. 4:12) will not seem to be an answer to any of the pressing questions or critical needs facing the ELCA. More precisely, it is and will be a counterintuitive move as long as the health and vitality of the corporate, gathered church is our primary concern. In fact, if our purpose is only to perpetuate the institutional church, then focusing on the ministries our people do every day will be a threat to our vitality. It will take away energy from propping up the crumbling walls. If, however, our purpose is to join God’s work in the world, there is no better place to do that than through the universal priesthood. **DuBois, Dwight. 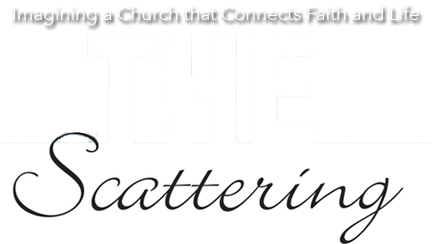 The Scattering: Imagining a Church that Connects Faith and Life. Eugene, OR: Wipf & Stock, 2015, pp. 147–48.